The entrance to Robbers cave is located south west of the center of the city of Lincoln, Nebraska. The cave system is a naturally made cave which is mostly limestone that has been chipped away and tunneled out by water over thousands of years. The earliest documented use of the cave was by the Pawnee Indians who named the cave Pahuk Bluff, and was used for spiritual practices. The Indians were removed from the area by settlers in 1858 and the caves were left unused until the 1860's when its thought it was a stop on the underground railroad, which were hiding places for the transport of slaves trying to reach Canada for their freedom. The caves extend for some distance with combined tunnel lenghts spanning for several miles. Near to the caves entrance is a 200 drop known as the well which is known to always contain a huge number of bats. Further down the main tunnel a large chamber can be reached by crawling through a narrow passage a few feet long, and in the chamber is thought to be were the famous highway man Jessee James hid when he was in Lincoln, this chamber has been named Robbers Roost after this story. This chamber is also rather odd as it is completely dry and has a thick layer of sand on the floor unlike the others. The cave closed to the public in the 1970's and opened again in 1985 but since then has opened and closed a number of times and is currently shut to the public. The strange thing about Robbers cave is how careful people seem to have been to stop the general public going into them. When the caves were open to the public only a small number of passages near the main area were accessible, and it seems a shame and a little strange to not have such a huge cave system with so many stories open to exploration. In the cavern known as Robbers Roost there is another passage way which carries on for quite a distance which has now been blocked up with thick concrete walls. 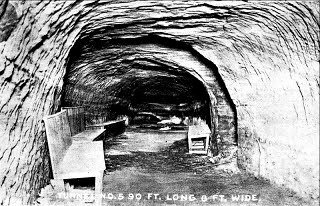 The reason for this is because of the near by prison and asylum which saw a number of inmates and patients escape through tunnels they dug into the cave system which all led through this cavern. Some of those who escaped never made it out of the cave alive, since when their light source ran out, which was probably nothing more than a candle with a few matches, they would be trapped in total darkness with no way of knowing which way to go until they finally died of thirst or hunger. Most of the people who escaped never even made it as far as to reach this chamber, and this is thought to be the reason behind the first ghostly experience to be had here. You can only imagine the sheer horror of having to sit in a cold, pitch black cave until you finally died from, well...........something. People who went through this would surely have a good reason to scream in desperation in the hope they would be found, until they could scream no more. People have claimed to here the sounds of blood curdling screams and shouts of desperation coming from the other side of the wall in Robbers Roost, echoing down the endless and unaccounted for tunnels. This chamber is thought to be a rather dangerous place, as people who have been in here have claimed that one moment everything will be normal, and the next a great sense of danger will overcome them, as if an evil presence was in the chamber with them about to attack. The other main ghost story to come out of here is the still lingering presence of the native American tribe which used the cave as a place of spiritual practices and worship. The sounds of beating drums echoing down the tunnels and thick mists, unable to be seen by the naked eye have shown up on photos.